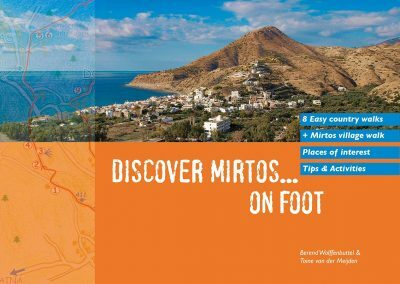 Views, old mountain villages, Minoan settlements, a gorge and much more offers the direct surrounding of Mirtos. 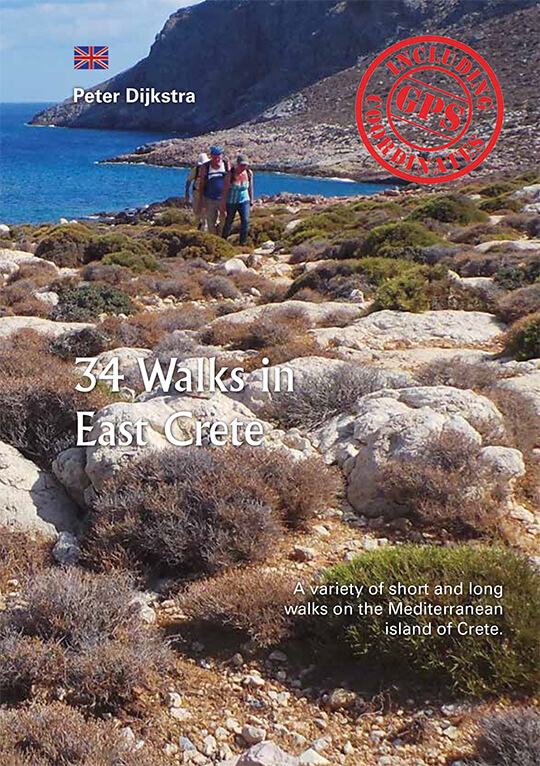 On eight marked walking paths with available description and map you can discover a unique part of Crete on your own. 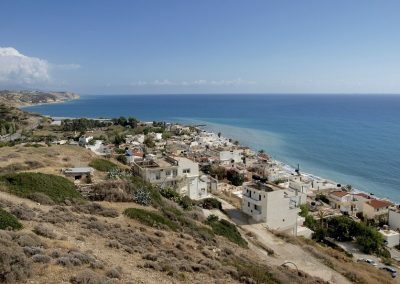 At the west side of the village is a conical shaped mountain, Kolektos. It is very difficult to climb on its steep slopes but along his foot leads a path, made for the needs of the shepherds. It is an ideal walk to get to know the region. 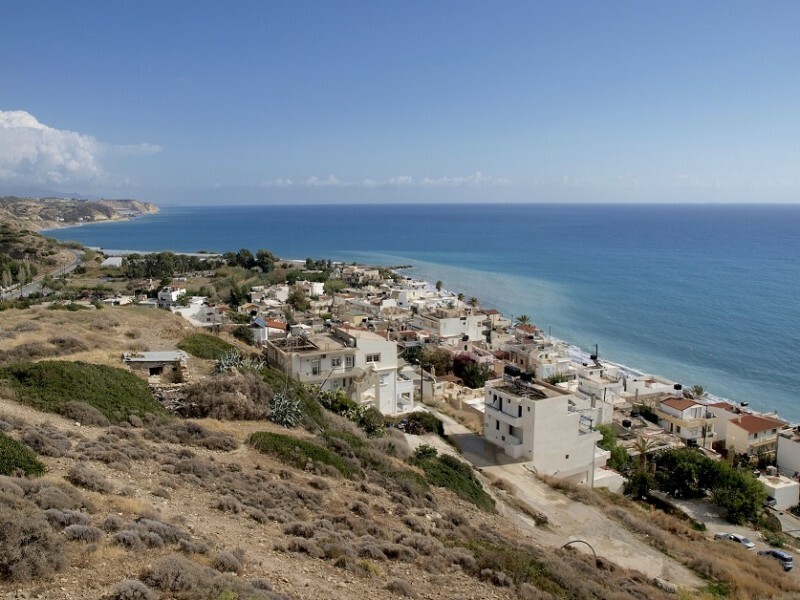 A walk along the partly rugged coast and further uphill in the hillsides. 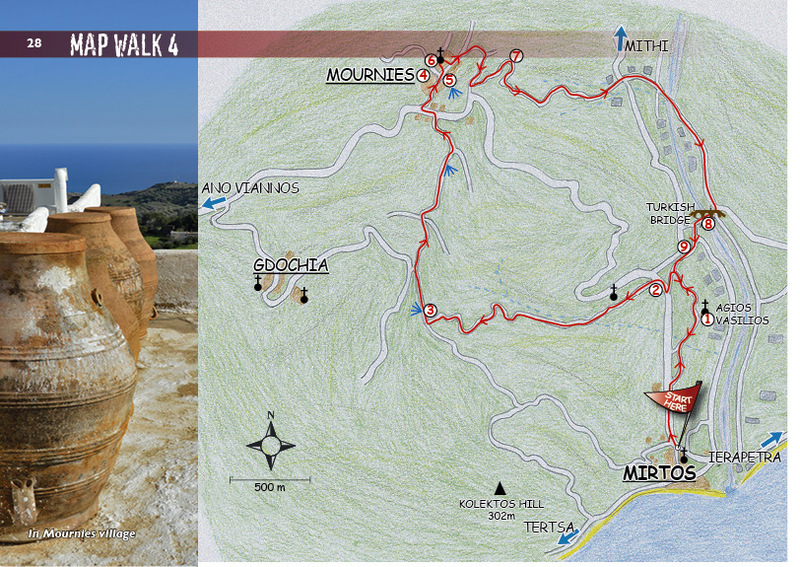 The return path offers fantastic views to the Lybian sea and the valley of Mirtos. 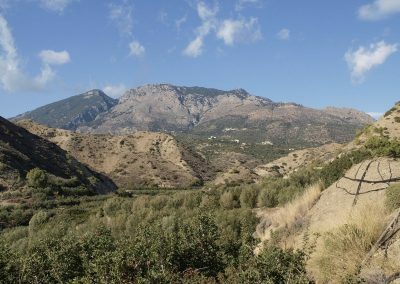 The longest walk in our offer leads through a mountain village, valleys, olive groves and through partly uncultivated land to the coastal village of Tertsa. The road along the coast back to Mirtos gives a beautiful contrast. 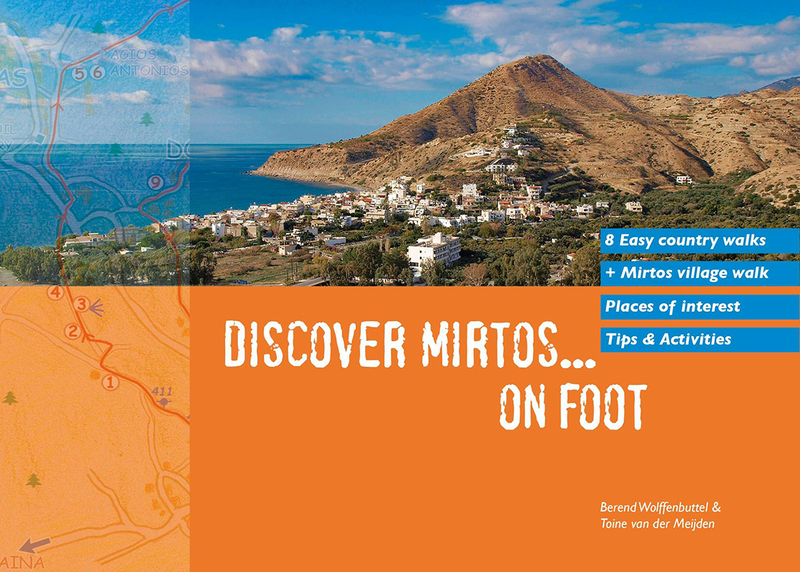 Mirtos is surrounded by several mountain villages, each one has its own specific character. 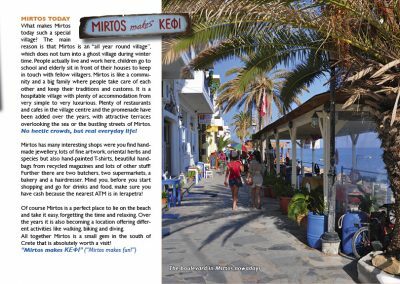 One of those is Mournies, with many old, whitewashed houses and a traditional Kafeneion. 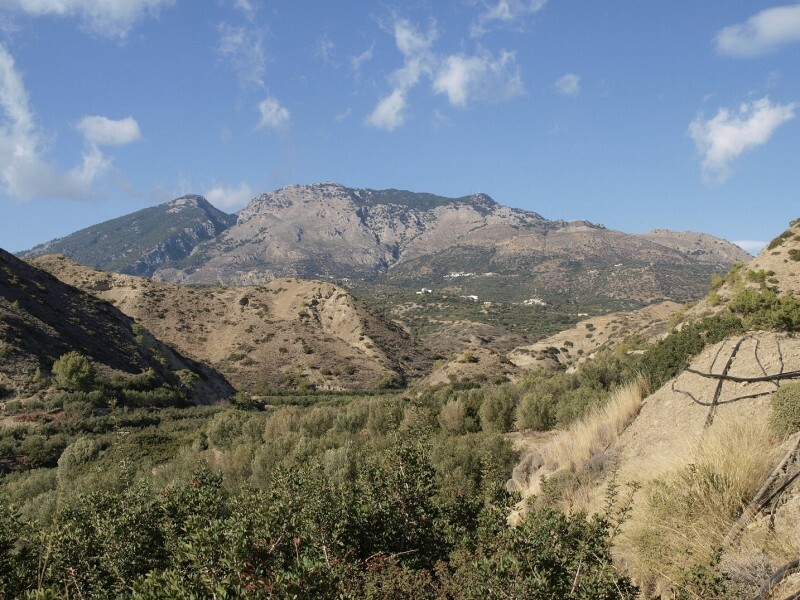 Enjoy the views to the valley of Mirtos while sitting there with a drink on the terrace. Another mountain village is Mithi. 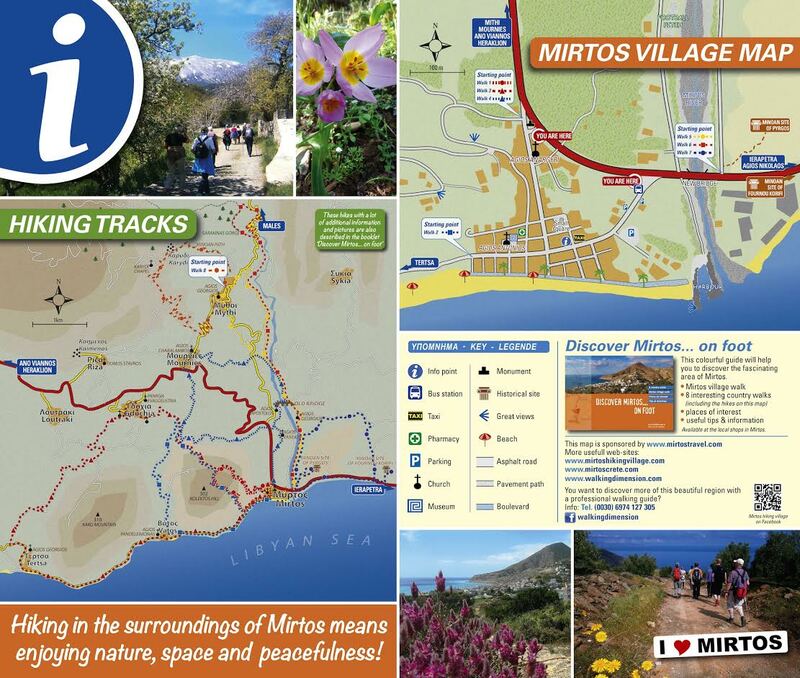 The walk leads through the wide and long valley of Mirtos along the old Turkish bridge. Mithi is a very fertile and green village which has been beautifully renovated in the last years. Enjoy a rest at the village square in the shade of the centuries old plane tree. 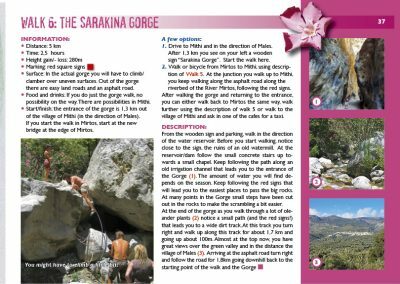 The Sarakina gorge offers an adventure of climbing over rock and depending on the season also crossing of water basins. 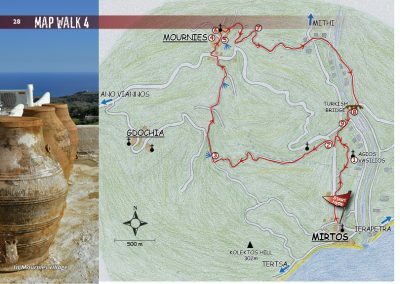 There are two options: to drive with the car to the entrance of the gorge or to combine it with a part of walk 5. 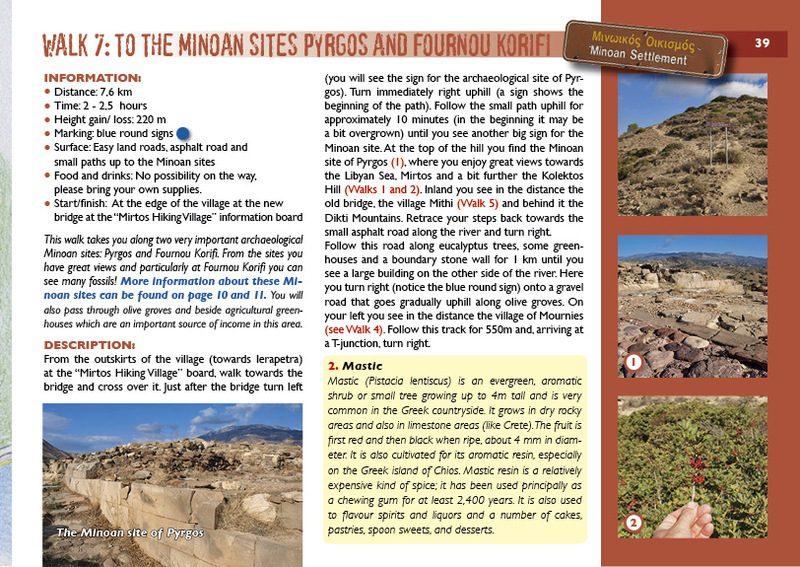 East of Mirtos is the location of two Minoan excavations, the hills of Pirgos and Fournou Korifi. 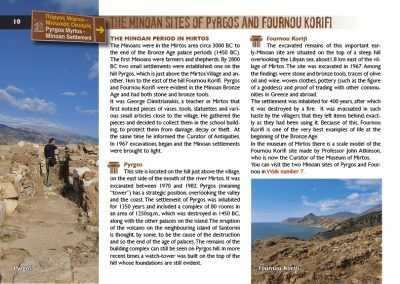 It is of big interest because it brings us in contact with the oldest high civilization of Europe. 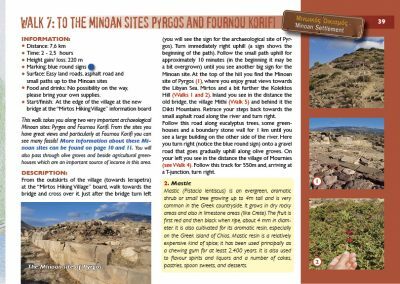 The so-called “Minoan path” actually has nothing to do with the Minoans. It is an old path that has always linked the shephards settlement Karidi in the mountains with the village of Mithi. 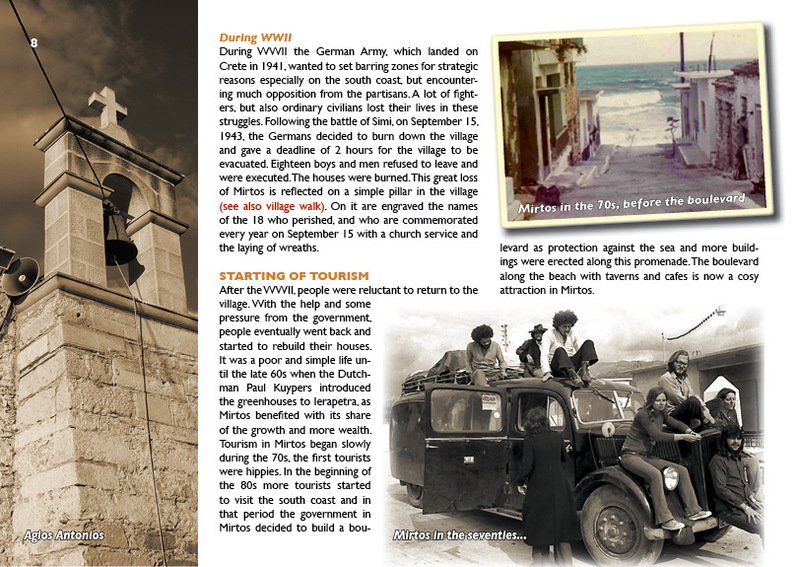 Since a few years it has been made accessible on the initiative of the mayor of the village and got his current name. 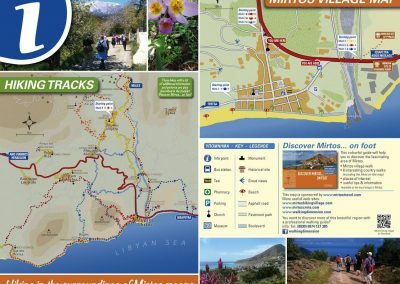 It is a nice circular walk with great views. 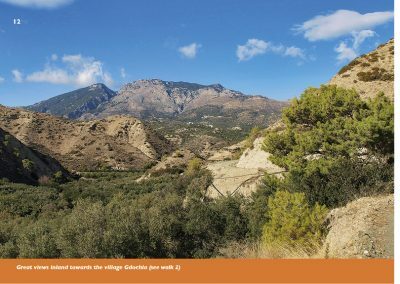 The booklet is a co-operation of Angela Sturmayr (Walking Dimension) with Berend Wolffenbuttel and Toine van der Meijden (Discover on Foot). 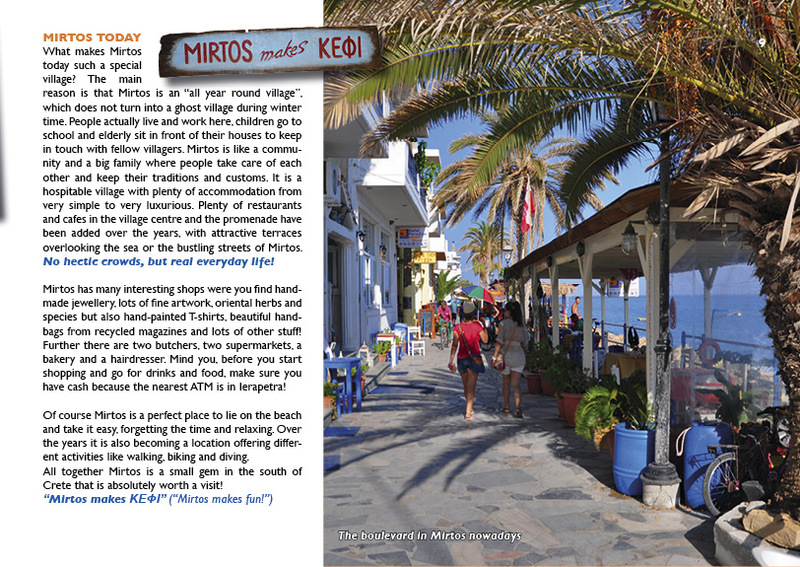 It is available in some local shops (Sunbudget, I love Mirtos, Soul’s Art) or in your accommodation. In the hot summer months you should consider to make the tours early in the morning or late afternoon only . Ensure that you always take enough water, food and a cell phone with you. Sun protection is very important in summer! If you are planning to do a tour alone, inform a travel partner or the owner of your accommodation about your whereabouts.